Kanchenjunga Trek is a challenging walk into the remote & unspoiled trails of Mt. Kanchenjunga (8586m) – 3rd highest peak of the world. The name Kanchenjunga means “five great treasures of snow” which refers to the five summits that make up Kanchenjunga. This massif forms the Nepal’s border with India’s Sikkim. This region is not only famous for panoramic Himalayan views, wonderful topogragphy of land but also unique insight to Nepali rural lifestyle and culture along with various rare wildlife species. The trail takes you to every climate Nepal has to offer from steamy jungles to jumbled glaciers at high altitude. Kanchenjunga massif is considered as one of the most beautiful mountain massifs in the world. 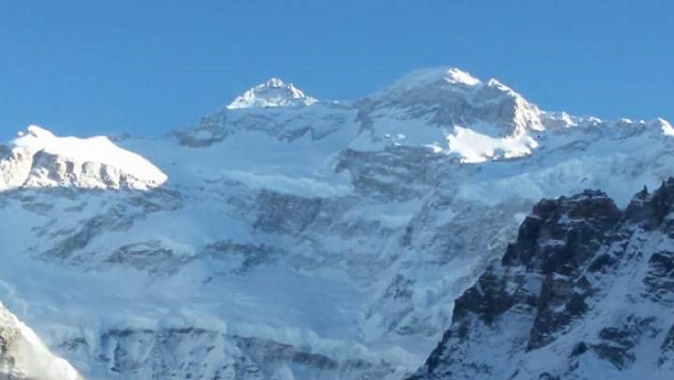 Kanchenjunga Trek begins once you reach Suketar via flight from Biratnagar. From Suketar we trek to Mitlung, Sukhathum and reach to Sherpa village of Ghunsa. The trails at the lower sections pass through fertile valleys with beautiful pastures, villages of Limbu people, cardamom fields and dense forests. After a day of acclimatization at Ghunsa we trek further north along the river bank us magnificent mountain scenery. We pass through meadows full with wildflowers, rhododendron and pine forest and reach to Nuphchu River valley area. We go further up towards Lhonak and along the Kanchenjunga Glacier to Pangpema, Kanchenjunga Base Camp on north side. Here we can enjoy the spendor of Jannu, Kanchenjunga and Chang Himal. Then we retrace back to Kambachen, Ghunsa. We cross several passes- Sinion La, Mirgin La and Sinelapche Bhanjyang and make steep descent to Cheram continuing to Oktang monastery. We move down to Sakthum, Phurumbo and to Taplejung-Suketar for a flight to Kathmandu. This trek lies in Kanchenjunga Conservation Area which preserves many endangered species of birds like Impedance pheasant, red billed blue magpie, amphibians and animals like elusive snow leopard, Himalayan black bear, red panda and many more. Ethnic groups of Limbu and Rai are dominant in this area who have their own culture and tradtion. Kanchenjunga trek is chance to explore some of the most beautiful mountains in world and valley that they surround with rural lifestyle and rich culture in harmony with variety of ecosystem from subtropical land to glacial wilderness. September to November and March to May are best months for travel.